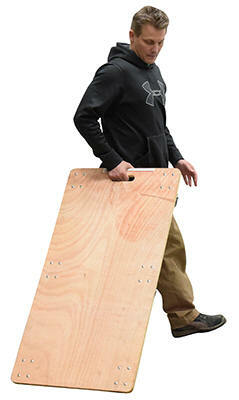 These oversized hardwood dollies are great for moving larger items. Manufactured from durable ." thick plywood components. Units roll on non-marking polyurethane casters. Capacity is 1,200 pounds. Model HDOS-2448-6SW features six (6) 4" x 1." swivel casters. Hand hole for carrying the dolly measures 5" x 1-1/2". Model HDOC-2448-12 feature two (2) rigid 5" x 1-1/4" and four (4) swivel 4" x 1-1/4" casters. 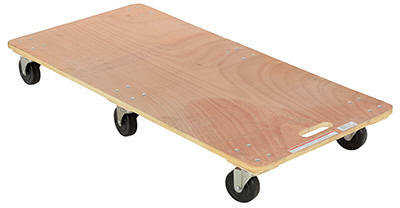 Larger rigid center casters allow dolly to tilt and turn. Side boards are 24"L x 3-1/2"W.